Both of us are employed earning ~164 GBP per month, paid in cash, both showed salary sheets and employment letters. Both of us had sponsors ( father, uncle) supporting our trips and showed their employment papers, intent of sponsoring and relevant bank statements. 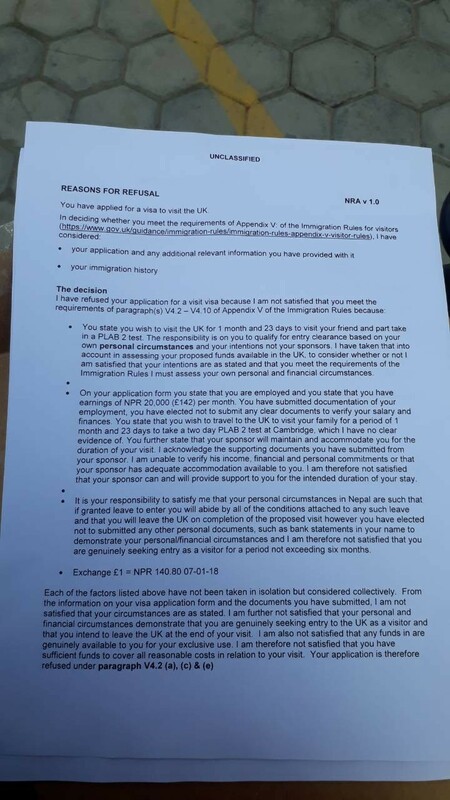 Both of us showed that we'd be accommodated by people in UK ( i showed my relative with British Passport, she showed her doctor friend with British Resident Permit) with all relevant documents - letter of support, pay slips, mortgage/ tenancy papers. Both of us showed our shares/ bonds certificates showing our investments in share market. However, ECA says `"2 day's exam" when it's clearly stated as 1 day and "stating at family in UK" when clearly stated it's a FRIEND, personal circumstances are similar, she got refused and I got granted! Normally we would close this question as a garden variety UK visa refusal on V 4.2 a + c (and sometimes 'e'). Why did my cousin with almost the same circumstances as I get a UK visa denial while my application was granted. That’s the element of randomness you find in visa applications.Theres no method to the madness sometimes. You could satisfy all criteria and get hosed while some applicants who live a charmed life could submit a weak application but get approved. The variables are myriad. Good luck trying to isolate the deciding factor. Sometimes it also depends on their mood that day. Every different ECO weights different criteria (e.g. being married or single) differently. She could reapply but note that her probability of being granted the visa will not be significantly different. She could make a short cover letter explaining the oversights of the previous ECO however it must be very respectful and subtle and be careful not to aggravate the new ECO.